The Vello White Balance Card Set for Digital Photography is an excellent tool for achieving perfect color balance in your photos. You can use it under any lighting condition, both pre- and post-production. This set includes an 18% grey card, a white card and a black card, as well as an easy-to-follow user's guide to aid in proper usage. The cards within the large set measure 10 x 7.9" / 254 x 201mm. 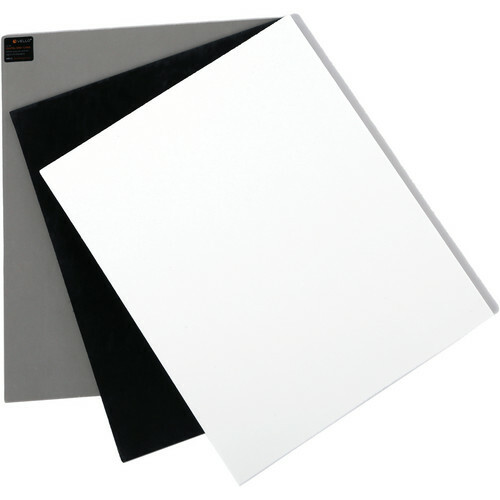 Box Dimensions (LxWxH) 11.0 x 8.8 x 0.8"
White Balance Card Set for Digital Photography (Large, 10 x 7.9") is rated 4.0 out of 5 by 18. Rated 5 out of 5 by Tomasz from Game Changer Getting the color temperature on a 5D and C100 to match can be tricky. I decided to give these cards a try so I can eliminate the hassle in post. The cards have been a true game changer for me. For example, I got back from a shoot the other day, completely white balanced by the cards and I was pleased to see that the two cameras had nearly the exact same color. Definitely as close as the two cameras could get - there is always a slight difference between these two cameras (from my experience). From now on, I take these on every shoot and I highly recommend them. Cheers. Rated 1 out of 5 by MB from Grey card is off Using Vello's grey card when shooting with a DynaLite 1000Wi pack and head, mostly with a shoot-through white umbrella for corporate headshots, I have found the color balance results to be significantly off. On my iMac and MacBook Pro I see results from RAW files that look noticeably Magenta (5000 / +13 readings) I bought the cards (White, Grey, Black) because of their size (8x10). I went back to my Prospec White Balance Reference Card, which I find too small (4.5 x 5.5). The Prospec card results were right on. (4700 / -3). I don't know if I am missing something, but one product is right on the money and the other is significantly off. I'm not sure why Vello would put a product out that does not do it's intended job. Rated 1 out of 5 by Nayeli from Not good for white balance These look like good quality and durable cards, but unfortunately the white card is more of a violet grey color, resulting in yellow images if you use it to white balance. The grey card gives a completely different white balance than the white, but is actually closer to white (though still a tad off). I suppose you get what you pay for. Rated 3 out of 5 by mlm1586 from Grey Card Set It's a grey card set not much to say. These are a little big for my taste. I would have preferred a 5X7 size though. The next smaller size was 4X5 I believe. I guess I am like Little Red Riding Hood a 5X7 is just right (for me) LOL. Plus I would prefer they be thicker 3/16 or 1/8 thick to make them more rigid. Rated 5 out of 5 by CHRISTOPHER from Does what it should and was a good price Not much I can say here, except they do what they are supposed to do. Size is great if your subject is far a way (easier to target in your viewfinder as they are larger sized). Not entirely travel friendly as they are larger, but you could cut them down to size if needed rather than buying smaller ones. Rated 5 out of 5 by Paul from Handy and well made The material seems durable so I am hoping it lasts a long time. Nice size so it fits in my camera bag or extras box. Nice for white balance and grey card for exposures. Having the black also allows me exposures for true black and true white needed in post. Rated 1 out of 5 by sejung from Bad quality at RGB balance RGB level is not same. The level of the grey chart is not 18% grey level. Green value is higher than Red and Blue. And it is too bright than 18% grey level. I don't recommand for friend to buy it. Rated 5 out of 5 by nick m. from My Life Is In Balance Now Actually I work too much, drink too much and have no friends, but all my video productions have perfect color thanks to this white balance card. #AnyoneWantToParty? What material are these large cards made out of? Cardboard or plastic? The cards are made of Foam-core.